Lettuce, spinach, chard, kale, carrots, beets, turnips, cucumbers, zucchinis, dill, parsley, basil, and cabbage. We’ve had a nice break from the heat the last couple days, and finally got some rain this week. Last night we got a bit more than we were hoping for, and once again were out digging drains. 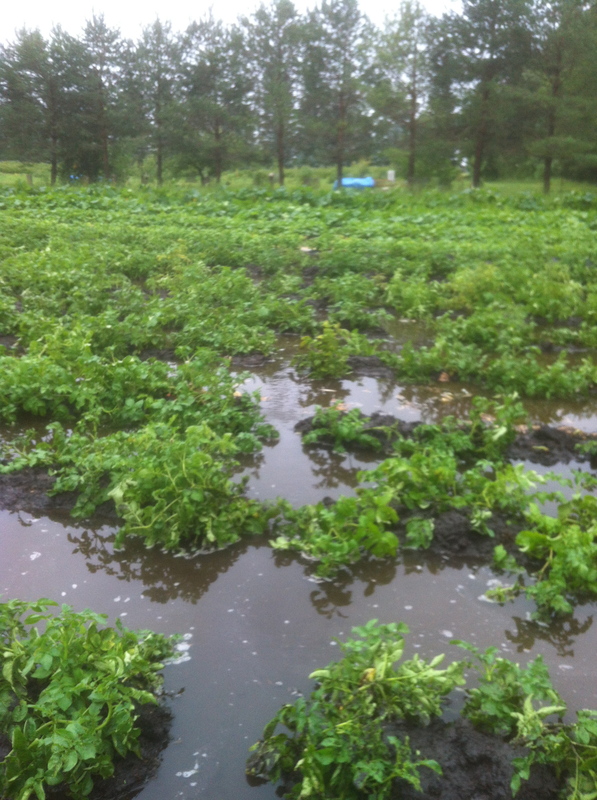 Now that the drains are dug through the potato hills, the water is flowing off the field quickly. I dug up a few potatoes and they’re looking good. Hopefully next week they will be big enough to start digging up for the csa. 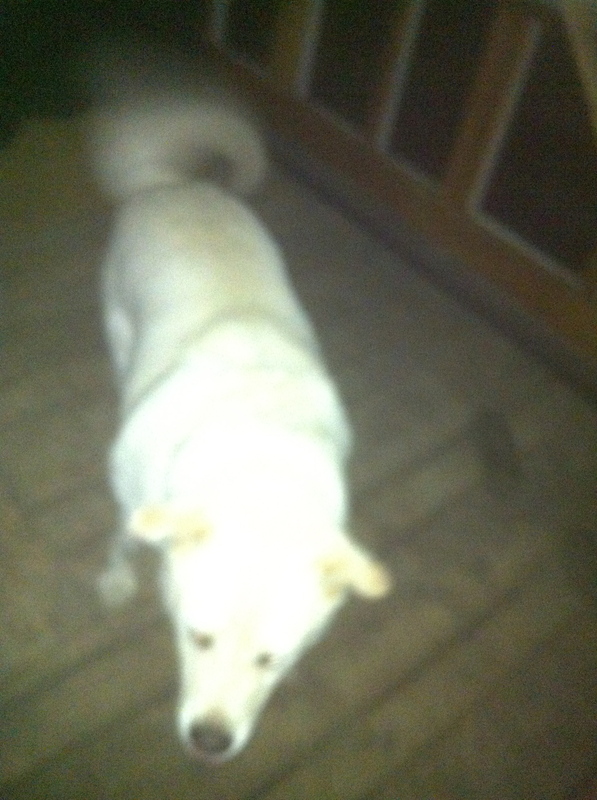 We’ve also started having frequent canine visitors at the farm. All the neighbourhood dogs that used to bark so fiercely at me when I would go for runs have started showing up at the farm and following us around all day. This is our latest visitor who’s started coming over every weekend and it stresses me out! I’ve nearly run him over a couple times because he naps under the truck or tractor if it’s ever stopped for more than 30 seconds. He pants so heavily I’m worried he’s always on the verge of a heart attack, and he always chases the truck, so I have to drive slow enough that he doesn’t die. He whines at the door when we’re inside and smells horrible when he’s wet. I’m so relieved that he finally went home last night! There will now be a honey vendor each Tuesday and Thursday! Mark-Jan will be selling his honey at my table, and there will be someone else with honey on Thursdays. On Tuesday Interlake Meadows will have grassfed beef for sale, and Thursdays watersong farms will have Trout. I’m still working on a consistent bread supplier. Hopefully soon! There’s no music planned this week, but next week there will be some good acts. This is a hilarious post (about the dog, that is). We got our first good rain on Sunday…like of the season. Looks like you got a bit too much. Seems like all the cloud just went right on past us and up to you guys.